Afternoon tea goes beyond a comforting cup of tea to help you get through the day. 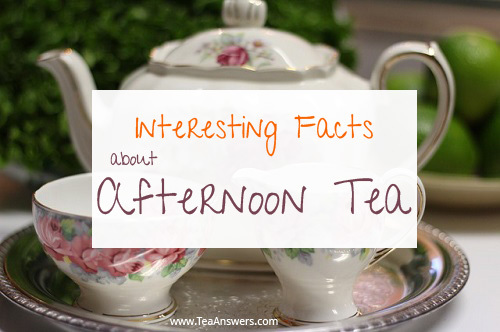 Let these afternoon tea facts show you how it began, what you can expect, and how you can plan your own tea menu. How Did Afternoon Tea Begin? Afternoon tea is a well-known and loved English tradition. It was started in the 1800s by Anna, the seventh Duchess of Bedford. At the time, people only ate two main meals a day – breakfast and dinner, with dinner being served at 8 pm. Anna began taking tea and a snack in her private boudoir in the afternoon to fill the long break between breakfast and dinner. Friends were later invited to join the Duchess for tea in the afternoon. As the idea of tea and a snack in the afternoon became popular, it became respectable enough to have it in the dining room. Before long, afternoon tea was the fashionable thing to do. However, it didn’t become a formal affair until Queen Victoria adopted the habit of afternoon tea. This caused it to evolve into a “tea reception” where up to 200 guests could randomly visit between 4 and 7 pm. Traditionally, the upper class had afternoon tea at 4 pm, just before everyone took their daily walk in Hyde Park. It was also called “low” tea because it was served on low tables (like a coffee table). The middle and lower classes had their version at 5 or 6 pm. The food served was much more substantial, as it generally took the place of dinner. It was called “high” tea because it was served at the dinner table. Afternoon tea isn’t as common nowadays. Lives are too busy for it to be a regular practice. It’s usually reserved as a special treat or a break from a busy day. It’s interesting to note that scones are actually a recent addition. They weren’t included until the early 1900s. What Types of Teas are Served? A wide range of teas are served. Guests have been known to sample anywhere six to a hundred types. While less traditional, a tisane (caffeine-free herbal blend) can also be served. Such as, Honey Lavender, which is a blend of lavender, lemon balm, and mint. It results in a pretty and calming brew. Many hotels and tea shops offer a special tea service in the afternoon where you can sample a traditional menu. But you can just as easily recreate it for yourself, for friends and family, or even as a special treat for children. It can be as simple or as fancy as you want. You can even throw multiple teas where you and your guests can sample the lighter and earlier low tea, or enjoy the more filling high tea. Whatever you do, enjoy this long-standing English tradition.